JenniePollock.com: What’s the point of…the theatre? Tags Choice, Morality, Movies, Telos, Truth, What's the point of...? As you may have spotted, I love going to the theatre, but I’ve got pretty exacting standards. It’s not enough for the play to be well-acted, in beautiful costumes on a creative set, I need content as well. I want a play to say something, to communicate something. I want to come out feeling that my perspective, my understanding, perhaps even my life has been changed at least a little by what I saw. After the Dance, which I reviewed last week, did that for me. I came out feeling that I had a greater understanding of the thoughts, fears and impulses which can drive people to act in certain ways. Questions of truth and illusion had been raised in a new way for me, and ever since, I’ve been carrying with me a heaviness of empathy for their struggle. It showed me anew the things people will turn to when the truth seems too challenging – two of the characters chose to die rather than to live in the reality of their situation; several others sought one thrill after another, keeping up a frantic pace of activity to avoid having to encounter the truth. It was a powerful snapshot of the culture among the well-to-do in the years between the Wars, and I’ve been wondering who today is writing in the same way. Who is casting a prophetic eye over our culture and holding it up for us to see? Good theatre is illusion used to clarify reality. Of course, there is a place in the world for ‘play’, for switching off and just enjoying light spirits and fun. But even theatrical productions with this as their goal have to have a story line, and it has often been said that the most satisfying plays (and films) are ones in which all of the main characters grow and develop in some way. Everyone is on a journey, and a play is an opportunity to step into a phase of a character’s journey and follow along for a while, watching the decisions he or she has to make, cheering when the right one is made, groaning when the solution – so obvious to the viewer – is missed. We need to be aware, as we watch, what principles we’re cheering, of course, for the negative side of theatre is it can sweep us so entirely into its worldview that we find ourselves advocating courses of action that we would never normally approve of; Entrapment, the Ocean’s series and The Thomas Crown Affair are just a few examples of movies which have me rooting for thieves and hoping they get away with their crimes! It wasn’t until I saw It could happen to you with some friends that I realised I had so bought into the worldview of the lead character (played by Nicholas Cage) that I was pleased when his (horrible) wife left him so he could go off and be with the (lovely) waitress who was so much better for him. How did a movie get me cheering for adultery?! 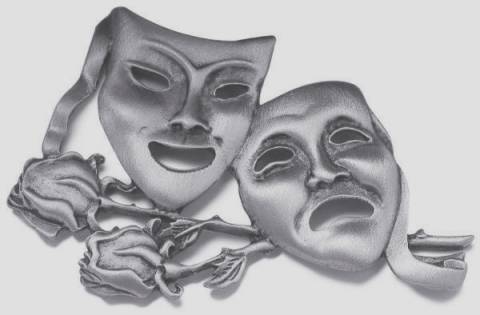 The point of theatre – and to a lesser extent, I think, the movies – is to make us think, to hold a spotlight up to the world and enable us to see it in a new or clearer way. Do you agree? Is theatre supposed to say something or just to entertain us? I so agree with you Jennie! I often find myself accepting the unacceptable due to the way the story line and characters influence me. It can be quite subtle sometimes. I believe that the motive behind many movies (more so than theater) is not only to entertain/make money but to influence society to accept behavior and beliefs that are not normally accepted under the idea that we need to be “free”. Freedom is found in truth only. Absolutely, Rachel! This is SOOOOO one of my ‘hot button’ topics! I think there is a place for pure escapist entertainment. For example, Murder Mysteries (such as the mousetrap) don’t always make huge social statements but are good entertainment anyway. In general though, you’re right, the theatre IS supposed to say something… it is definitely designed to envelop you in a story and so that story will leave its fingerprints in your psyche long after the lights have faded and the curtains closed. I think though that the same can be said EQUALLY of movies. After all, movies are just plays put on film. The rules are the same for how they need to grip your imagination and draw you in to the story. It saddens me, even in my own life, how much we, how much I, forget that what we watch over and over again teaches us, trains us to think in a certain way and alters our perception of reality, of truth.